Hallo! 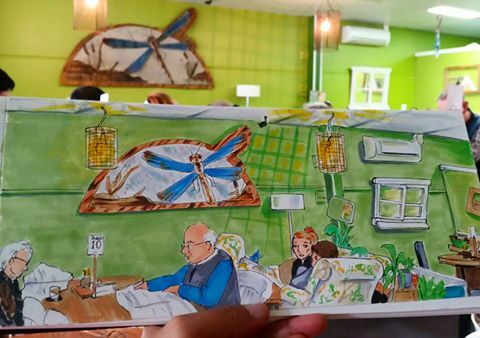 I drew this last week while having brunch at the Blue Dragonfly cafe in Kilmore and one of the owners saw it on facebook and bought it! Woo hoo! I am passing by tomorrow to collect payment and possibly sketch around the area too. Should be fun. I am truly enjoying the time off work. Work is coming though....so not to worry! Looks like it's going to be a very heavy job too. I still haven't updated my tumblr site or done my taxes. I was working on a digital drawing today for Kookyrabbit and it took much longer than expected. Oops! It is nice to spend time on a piece without rushing too much! Hoping for a good and productive day tomorrow!